Cloak of Gehenna: A great flowing cloak of strange violet and black material, this garment radiates a globe of invulnerability at all times, preventing all spells and device effects of 1st through 4th level from affecting the cloak's wearer. Any attempts to bring this globe down with dispel magic are at -20% in addition to the normal modifiers. Ythuus stands seven feet tall, a faceless humanoid with large, orange eyes that contain no pupils. Its dark gray skin is largely concealed by a flowing violet-black cloak. Honestly, Ythuus is a fairly alarming being to have to look at. Ythuus hails from the lower plane of Gehenna, where the daemons play an ever-changing role in the eternal battle between the demons and the devils. The daemons are ruled by the ultradaemons, and of those select few, Ythuus was among the most powerful - the elite of the elite of a powerful and mysterious race. For this reason, Ythuus must have been taken doubly aback when it was forcibly banished from its home plane and imprisoned on the Prime Material plane. The daemon has no idea how or why this happened, but a valid assumption would involve several others of its kind banding together and betraying it. Since arriving on the Prime Material Plane a year ago, Ythuus has tried everything in its power to return home...without success. Failing that, it then attempted to learn details of its situation...also without success. Ythuus' ability to gate in other daemons from the lower planes has not worked since the day it arrived here. A being of its power and experience does not get frustrated easily, but Ythuus is running out of ideas and options. Ythuus rarely enters combat and rarely has to, but its great strength and fearsome poleaxe can make even the stoutest-hearted foe take note. 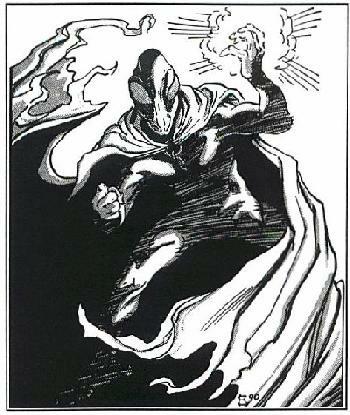 The ultradaemon typically uses spells to strike from a distance, weakening and debilitating foes as much as possible. Ythuus cares only for one thing: returning to Gehenna and destroying whoever was responsible for its predicament. It has no true interest in the Nine and their plans; it has joined their ranks in an attempt to find someone who can help it get home. Ythuus communicates exclusively by telepathy, and it is amused when this disturbs others. It also vexes the daemon somewhat if someone doesn't seem too bothered by this mode of communication. Ythuus is a very tidy, clean being and keeps its chambers that way as well. Ythuus is alien to all other members of the Nine. Nobody manipulates or tricks it, and nobody attempts to. It is perhaps the most respected of the group, if only because it is the most enigmatic and the least vocal. The fact that the daemon's appearance is quite bizarre also serves to unnerve any who must associate with it.